My daughter and I wished to visit Thandikudi Balamurugan Temple. After the darshan at Palani Murugan Temple, at Palani Hills, we proceeded to Thandikudi which is about 95 kms from Palani. Thandikudi is a beautiful place located at 1500 meters above sea level, in Kodaikanal taluk. It is also called as Aadha Kodai (half Kodai) and a trekkers’ paradise. The travel was adventurous as well as exciting. 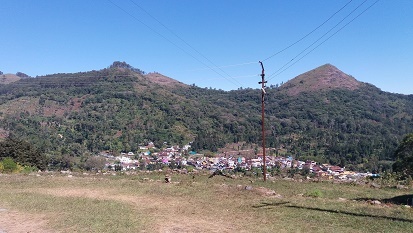 The travel was adventurous because we had to travel on very narrow and zig zag roads, through Kodaikanal Ghats. There were many 'deep curve' boards displayed on these roads, to alert the drivers. Google Map was helpful in guiding our way. 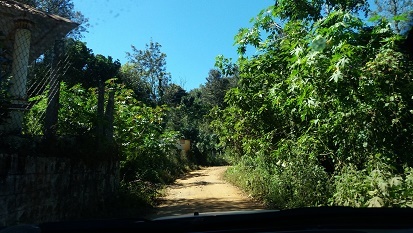 Though the roads were very narrow they were well maintained and no potholes were there. One has to be very careful and alert all the time while driving on these roads. Otherwise we won't be able to see the vehicle coming from opposite side. We were driving at a very low speed. It took us about 3 hours to reach the place to cover about 15 kms. We stopped at a few places to enjoy the astounding scenery. We passed through few temples and villages on the way. The views from top to down and the views from bottom to top were amazing. The breeze came through these Hills were so pure that we will never get in our daily life in cities. We occasionally saw some people walking on the road side and wondered how these people stayed there in the isolated places.. One can notice a spectacular change in the flora as we reach towards Thandikudi. After the tarred roads we had to take a turn to a muddy Road where no one was in the vicinity. The serene beauty of the place was enhanced with the greeting of the coffee and cardamom plantations, rolling hills filled with vanilla, pepper, banana, dense forests and the lofty mountains. After sometime we reached our destination and spotted the temple of Sri Bala Muruga. We parked our car outside the gate. As we entered inside, we saw the idol of Lord Vinayaka immediately after the gate. Then we walked towards the temple, but no one was to be seen there. After admiring the peacock statue in the temple hall for some time we called out "Is there anyone out there?" In the next moment, we saw the temple priest’s head sticking out from inside through the closed curtain. He asked us to wait for some time since the pooja was going on inside. After a while, the temple priest came out opening the curtain. We had a good darshan of Lord Balamurugan. He explained to us the story of the temple- After a fierce fight with Asuran Idumban, Lord Murugan jumped from this hill to Palani Hills and hence it got the name Thandikudi. Thandi in Tamil means to jump across and Kudi, is clan-based settlement. Although the temple is believed to be 2000 years old, the temple what we see today was built in 1949. It was built as a result of a dream to a Swami named Sri Pandrimalai Swamigal, ordering him to build a temple at a place where a torch light was seen on the Thandikudi hill. As we were listening to the story the temple clerk also joined us. As per the pujari’s instruction, he took us around the temple and showed us the Thandikudi village which was in the shape of a peacock. By the side of the temple, a rock with footprints said to be of Lord Murugan and another rock that appears as a peacock (Lord Muruga’s vehicle) holding a snake. There is also a small perennial spring on another rock in which is reflected the shape of Lord Muruga’s spear and it is considered to be the sacred theertham of the temple. There is a small room towards the side of the gate where statue of golden colour horse and chariot were housed, which are to be used during the festival. After a wonderful time in the temple and the surroundings, we left to our next destination Kodaikanal.